Invictus Gaming a.k.a. 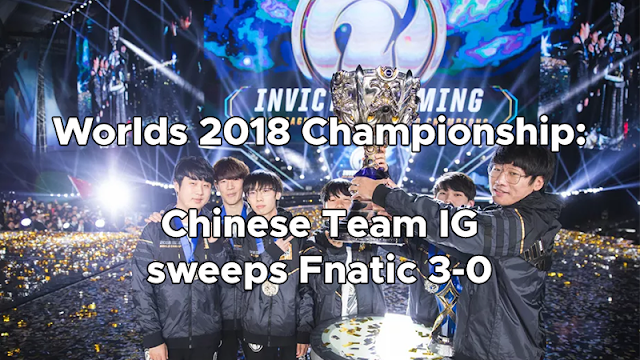 IG wins the 2018 League of Legends World Championship, the first Chinese Team from LPL to win the most prestigious LOL tournament, after defeating EU LCS ace team Fnatic with clean 3-0 sweep. The finals was held at jam-packed Munhak Stadium in Incheon, South Korea on November 3, 2018. Ning's jungling strategic skill is the key to success of IG, giving his team a 3-0 victory. His cunning Camille and AP Gragas pressured Fnatic lanes which results to overwhelming KDA scores and gold advantage. This also leads him to become the Finals MVP. Fnatic Caps is IG's prey in Game 1 with the lead of Ning. Aside from Caps's Irelia being prey, Ning's Camille also camps in the top lane feasting on Bwipo's Urgot. Pressuring Fnatic mid lane eventually led to IG taking mid turret before 15 minutes. The aggressiveness of IG TheShy's Sion, Rookie's Lissandra, and bot lane tandem of JackeyLove's Kaisa and Baolan's Alistar outperformed Fnatic in every team fights. From there, the game continued to favor IG's side. IG team secures Baron kill attaining the buff to end the game at 27:06 mark. Game 2 was still in favor of IG. As IG TheShy's Irelia and Ning's Gragas continues to pressure Bwipo's Urgot on top lane. By continuously camping that lane, they managed to put TheShy's Irelia into nightmare champ in the game. This leads to team Fnatic being tilted on every team clash. Team IG ended game 2 with landslide kill score of 22 against 6 of Fnatic. Game 3 was a do-or-die for Fnatic. Determined to get the game 3, the team decided to change their top laner, from Bwipo to sOAZ but with same champion pick Urgot. Fnatic initiated the first skill as Caps's Viktor, Rekkles's Xayah and Hylissang's Thresh targets IG Baolan's Rakan. Fnatic also created sparks of hope when Broxah's Jax managed to blindly steal Baron from IG, but the unwavering team IG was really strong as they continued pressuring all lanes, and outplayed Fnatic, ending the game 3 in 25:22 mark. Invictus Gaming received 843.750 USD which is roughly 44.9 million Pesos, while Fnatic had 303,750 USD which is roughly 16.1 million Pesos. The total prize pool is 2,137,500 USD which was divided by 16 participating teams. Chinese teams are now dominating League of Legends as they also show their skills and won the gold in LoL 2018 Asian Games. What can you say about the victory of IG in Worlds 2018 Finals? Let us know in the comment section below.